BuySCPlays’ website states that they can deliver high-quality Twitter Followers fast, though we didn’t start getting followers until 2 days after the order was placed and it took a while for the order to finish. 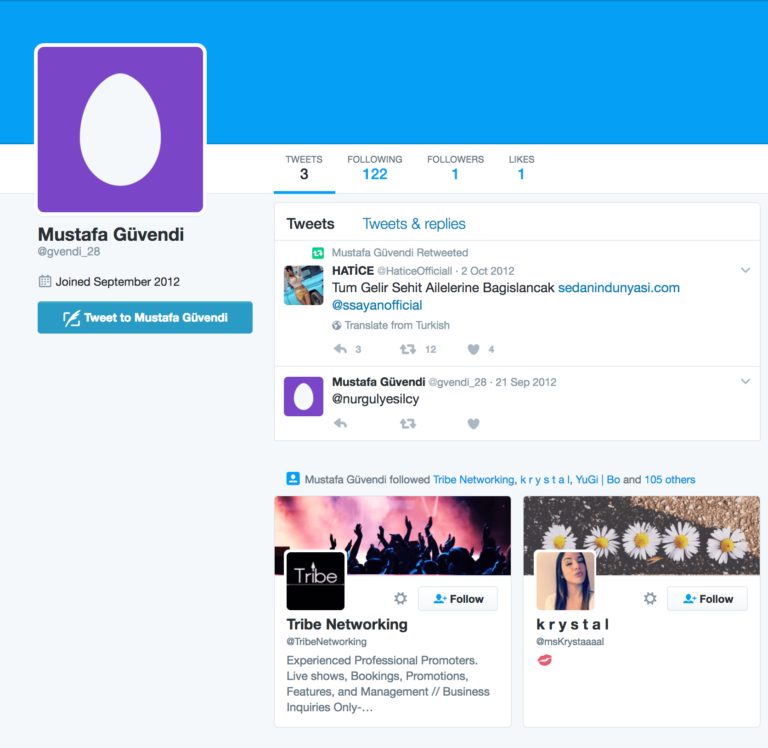 Many of the followers are also not high-quality, with eggs instead of profile pics and incomplete bios. Customer support was responsive, though we didn’t end up seeing the quality of followers we thought they would get. Registered in the Bahamas and in business since at least 2015, BuySCPlays specializes in SoundCloud social media boosting services. They also offer services for Twitter, YouTube and Vimeo. BuySCPlays has solid customer support and protections for customers, like a money-back guarantee and a retention guarantee. This shows that they care about your reputation online, and will take steps to help you protect it. BuySCPlays specializes in SoundCloud services, but also offer Twitter followers and retweets. They claim to offer high-quality accounts with their own bios, photos, and followers. Their plans are slightly below-average priced. They offer no standard for how quickly they will deliver their services, which is not a great sign. Nothing stands out in their Terms of Service and the terms are pretty standard, overall. BuySCPlays provides a Refund Policy if the customers’ needs are not met within 30 days. They also offer, at their sole discretion, pro-rated refunds for partially completed services. The company offers a 1-Year Retention Guarantee. Their Retention Policy can also be found on their Refund Policy page. Customers can request for replacement by filling out the form on their Replacement Request page. The contact page for BuySCPlays was fairly easy to find, with a Contact link at the bottom of the page. You can contact them through an on-page contact form. Before ordering, we sent a few questions to test the response of their customer support. They responded pretty quickly, within around 7 hours. Their response was good, answering our questions thoroughly and providing some example followers. However, many of the followers we ended up getting did not match that standard of quality, having egg profile pics and no bios. This seemed a bit tricky, as they were promising something they didn’t deliver. 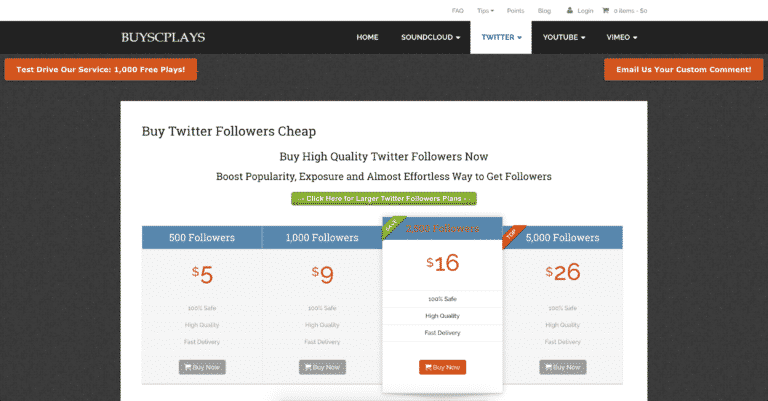 BuySCPlays’ Twitter Followers service can help customers attract attention and look more popular on Twitter. While the followers are Suitable-For-Work, many of them have default profile photos. They can increase your numbers, but upon closer inspection many of them won’t look very good. Our order did not start arriving until two days after we ordered, which is within the time frame stated by BuySCPlays. The company stated that their followers are high-quality, but on the whole they turned out to be of poor quality. The rate of delivery was pretty natural, coming in at a few hundred per day. However, the followers did not come in full until 7 days after we placed the order, which is longer than we expected. We contacted BuySCPlays about this, and they sped up the delivery to our account. The followers are not high-quality as advertised. Many of them do not have profile photos or unique bios. They also do not actively tweet or engage our tweets. BuySCPlays states that their Twitter followers will stick with you. However, they also offer a 1-Year Replacement Guarantee if you lose any. We saw our follower count going up and down for a while, before reaching 1,000. BuySCPlays is a legitimate company that offers social media boosting services. They claim to offer high-quality Twitter Followers, though the followers we got do not have profile pictures and complete bios, for the most part. Most of them show no recent activity. The delivery rate was also not as fast as advertised, taking a while and requiring us to send a message to customer support. However, they have retention and money-back guaranties, and are open to refunds. BuySCPlays offers Twitter Followers that can improve your numbers, but upon closer inspection many of them will be found to be low-quality. If you’re looking for higher-quality followers, take a look at our Top 10 List. My order for 1000 twitter followers arrived within 48 hours of placing my order. The followers i got had bios and pictures making them seem legit. Overall i was impressed by the quality of service i got. The customer support team assured me that they would deliver quality followers fast. I decided to try them out and incredibly they the followers of very high quality with a majority replying to my tweets. This is a great service and worth every dime. I am impressed by the way i have been handled by the team at buyscplays, i needed a service that would guarantee me hundreds of followers in less than 3 days and within 36 hours of getting in touch the job was done. I have to give it up to the guys behind the service. I got my Twitter followers boosted to the tune of thousands, without having to share my logins. As they say, I have used them and they delivered the Twitter followers as I had wanted. Tried their Twitter follower offers with a 1k package. Their rate was good, and they got the job done. I however realized that I mysteriously lost some followers later. I like sampling what different Twitter follower service providers have and so I did look at how buyscplays do their art. My order for 2000 followers was good and I think they did their part well. $5 for 500 followers is what I spent and the resulting followers weren't active accounts as I'd have expected. That's why I think they're expensive. My experience buying Twitter followers from them was not smooth. The process had back and forths. Maybe they should stick to SoundCloud services. Buyscplays supplied me with twitter followers and I was satisfied with the 8k as ordered. I cannot complain.